It’s bitterly cold outside, and one could be forgiven for feeling as though the baseball season is impossibly far away. Casual fans might peruse Bleacher Report to find marquee players like Bryce Harper, Manny Machado, and Dallas Keuchel still unsigned and reasonably conclude we remain trapped in the doldrums of the offseason. But the reality is that Yankees pitchers and catchers will be reporting to spring training less than three weeks from today. The 2019 MLB season is right around the corner. And despite the many superstars that remain on the free agent market, it appears the Yankees business is all but done. While some fans (including myself) still bemoan the front office’s decision to pass on the generational talents available for nothing more than cash, it is hard to envision the Bombers making another big splash. 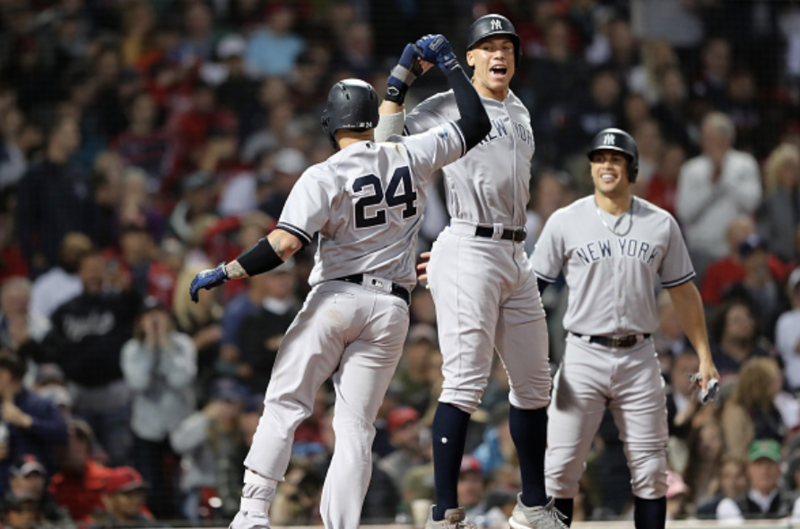 Though it is sadly unlikely that Harper or Machado will be donning the pinstripes in 2019, the Yankees have improved in significant ways from the 2018 edition that fell painfully short against the Boston Red Sox in the ALDS. 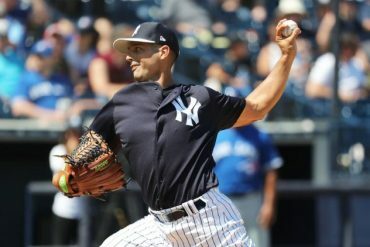 Cashman began the offseason with a clear statement of intent, trading top prospect Justus Sheffield in a package to acquire premier starting pitcher James Paxton from the rebuilding M’s. Then, a series of savvy free agent signings that included J.A. Happ, Zach Britton, Adam Ottavino, DJ LeMahieu, and a discounted Troy Tulowitzki helped plug the glaring holes in the MLB roster. Whether you love or hate the individual moves, in sum they leave the Yankees a more talented and deeper team than they were last season. So what can we expect from the 2019 Yankees? What areas of the roster grade out as strengths, and where does a lack of depth leave the team vulnerable in case of injury to a key player? Let’s break down the entire 40-man roster as we approach spring training, and examine where the team might still have room to improve through minor transactions or midseason trades. The top of the Yankees rotation projects to be among the very best in the league next year. Severino and Paxton both can and have been ace-like starters with the potential to dominate games for long stretches of the season. In the next tier, both Tanaka and Happ have established track records and are wily veterans with the ability to eat innings and churn out quality outings on the mound. Last but not least, Sabathia’s reinvention as a crafty southpaw suggests quality production as long as he can stay on the field. On paper, those five pitchers each carry significant upside and the potential to anchor the team’s rotation for most of 2019. That being said, each one comes with their fair share of risk. Severino experienced a season of extremes in ’18, producing a Cy Young worthy 2.18 ERA through June before cratering to a 5.20 ERA from July through September. Whether caused by increased fatigue, a loss of confidence, or his much-discussed tipping of pitches, the Yankees need Severino to be his first-half self for the entirety of 2019. If he can be, the Yankees have one of the few legitimate aces in the league taking the ball on every fifth day. For Paxton, his extensive injury history serves as the point of worry. While most of his injuries have been one-offs and he’s avoided dreaded surgeries to his throwing shoulder or elbow, the fact remains he has averaged fewer than 20 starts per season since breaking into the league. He set his high water mark at 28 starts last season, and hopefully health troubles are behind him as his career progresses. Finally, Tanaka, Happ, and CC simply have huge variability in their performance. Tanaka has flirted with both ace status and replacement level production. Happ is 36 years old and despite being the model of consistency in pinstripes last year, the drop off could come at any moment given his age. Finally, Sabathia’s persistent health issues leave him unlikely to exceed 150 IP, and the possibility of a significant injury sidelining him this season appears to be high. Given the outsize possibility of injury to one or more starters, depth in the rotation will be crucial to the team’s success this season. Anticipating intermittent injuries to CC, Happ, and Paxton, it is conceivable that there will be upwards of 20 starts that need to be handled by pitchers not slated into the opening day rotation. In this regard, the Yankees depth grades out as both a strength and a weakness. There is no shortage of options to choose from, with a stable of Quad-A types providing cover in case of key injuries. That being said, none of the above options inspire particular confidence if you are a fan. German showed flashes of brilliance but was largely unable to put the pieces together to become a serviceable MLB-caliber starter. In a similar way, there are things to like about young starters Jonathan Loaisiga and Chance Adams, but neither seems prepared to immediately step in to the rotation for a team competing with the defending champion Red Sox for the AL East title. The most intriguing option is Jordan Montgomery, who has pitched to a 3.84 ERA (4.19 FIP) in his career to this point. Coming off Tommy John surgery and with his timetable still uncertain, it is hard to expect any major contributions from Gumby in 2019. But should he come back strong, he would give the Yankees a legitimate sixth starter option and an added level of depth not currently available entering the year. By almost any metric, the Yankees will have four of the best 25 relievers in baseball entering next season. Indeed, the six locks for the opening day bullpen will collectively comprise one of, if not the best bullpen ever assembled by an MLB team. There is a legitimate argument that Chapman, Betances, Britton, and Ottavino would all be closing on almost any team in the league, and Green and Holder are versatile relievers that posted sub-3.00 FIPs last year. Not much more really needs to be said about this bullpen. The depth and quality of their six top relievers is supplemented further by potential bounce-back candidate Tommy Kahnle, who was dominant in 2017 before spending much of 2018 toiling in Scranton. Even if they receive nothing but replacement level production from the remainder of their bullpen options, this collection of arms can sustain injuries and slumps better than any other team in baseball. At full strength, Boone will have the ability to consistently end games after just 5 innings, relieving stress on the starting rotation and further strengthening the team. Yes, relievers are notoriously fickle, and yes questions persist about Chapman’s control issues, Britton’s continued recovery from severe injury, and Ottavino’s adjustment to the American League. But I remain more confident about this relief unit than I am in any other aspect of the Yankees team, and any other bullpen in the rest of baseball. These guys are going to be fun to watch in 2019. While the roster appears set, the configuration remains anything but at this juncture of the offseason. After bringing in LeMahieu and Tulowitzki to provide cover for the ailing Didi Gregorius, there would seem to be a legitimate battle for starting places set to take place in spring training. While it would be a shock to see Gleyber, Andujar, or the recently added LeMahieu relegated to the bench, where they will appear and how frequently they are rotated remain open questions for 2019. Unlike the starting rotation, which has a certain boom-or-bust feel to its success in 2019, the infield appears to have something of a low ceiling but high floor for production. With five quality major league options, each with a degree of versatility, making up the opening day roster, this is not a unit that looks susceptible to being compromised by a single injury. Especially once Didi returns from surgery around (hopefully) midseason, there will likely be regular rotation and the ability for Boone to ride the hot hand throughout this year. Each player is projected to produce around 2.0 WAR this season, which jives with my anticipation of steady but unexceptional production from the infield positions in 2019. Should Andujar transition from a woeful to simply average defender, or if Tulowitzki can stay healthy and produce at anything approaching his career averages, the upside for this unit ticks north in a significant way. Even more tantalizingly, if Gleyber can sustain his early season production from 2018 when he slashed .325/.380/.663 in the month of May, the potential for this unit to exceed expectations remains a distinct possibility. But, in my mind, the question marks in the negative column nearly cancel the positives and lead to my uninspired projection for the Yankees’ infield. Andujar could just as easily regress offensively as progress defensively. A healthy and productive Tulowitzki is perhaps even less likely than a reduced Didi upon return from injury. And the massive unknown that remains Luke Voit and Greg Bird as the first base unit could be a drag on overall infield production, much as it has been since Mark Teixeira’s last elite season. While I hope that every player outperforms their projections, I am realistic and cynical enough to think that 1.5-2.0 WAR production from each position would be a success for this infield. Thankfully, they don’t have to be the superstars of this team but rather just do their respective jobs since there is more than enough firepower in the outfield to compensate for shortcomings on the diamond. Maybe more than any other part of the team, the performance of the outfield will dictate whether 2019 is a success or failure for the Yankees. The reason is obvious: three of the team’s four best position players were in this unit last year (Judge 5.o WAR, Hicks 4.9 WAR, Stanton 4.2 WAR). The only infielder to make the cut was Didi at 4.6 WAR, and as mentioned above he will be out for at least half the season as he recovers from surgery. Simply put, the Yankees best position players are outfielders and their health and performance will drive this team in 2019. Even more encouragingly, I would argue the outfield is more likely to outperform its 2018 production than underperform it. Judge was on pace for a second consecutive monster year before a midseason injury derailed much of his second half. Stanton was incredibly streaky, much to the ire of many fans. While the calls to trade him and sign Harper were loud in the wake of his pathetic postseason performance, he is just one year removed from an NL MVP campaign in which he slashed .281/.376/.631 (159 wRC+). Regression to the mean for Stanton would imply improvement, as his wOBA and ISO declined despite a career high in hard hit rate. It is not hard to envision Judge and Stanton’s combined WAR jumping from an already high 9.2 in 2018 to a stratospheric 12.0+ in 2019. After titillating fans for the better part of two season, Hicks finally broke out in a big way last year and established himself as one of the premiere centerfielders in the game. After health issues and inconsistency defined the early part of his career, last year marked the moment when Hicks put together his contact, power, baserunning, and defense to become a legitimate five-tool player. Some fans perplexingly still believe his performance was a fluke, but as he hits his prime and plays in a contract year I think 2018 Hicks is a good marker for who he truly is as a player. Health questions remain, but it is entirely likely Hicks will round out the top three Yankees position players again in 2019. But there is no question this outfield unit is remarkably top heavy. I don’t dislike bringing Gardner back on a one-year deal, but at 35 he looks set to be serviceable at best and replacement level at worst. Clint Frazier will attempt to rebound from a season derailed by concussions, and while I continue to love his tools, the health concerns overshadow much of his potential to be a significant contributor in 2019. And I have absolutely no expectations regarding Jacoby Ellsbury, the $22 million traffic cone who did not see the field last season. The combination of a top heavy outfield with shallow and unpredictable depth is a scary prospect, and major injuries to Judge, Stanton, or Hicks could derail the season. Hopefully, Gardner can battle Father Time, and Frazier can become a productive contributor in 2019. But I remain both delighted and terrified of the Yankees outfield makeup entering the season. I know, I know, where is catcher?! No, I didn’t forget, I just don’t think it’s necessary to devote an entire section to a single position that is also the hardest to predict for the Yankees in 2019. I continue to believe Gary Sanchez is among the best catchers in baseball, and will return to form in 2019 as the elite baseball player he is. But that is far from a sure thing, and injuries could also force Austin Romine and Kyle Higashioka into significant roles throughout the year. Ultimately, this is a team that has one of the largest collections of talent in the MLB. That bodes well for a successful season, and hopefully a successful postseason run, too. But significant weaknesses in quality outfield and starting pitching depth could leave the team vulnerable to key injuries and force the front office into midseason moves. Hopefully, the wealth of options Aaron Boone can draw from will keep players fresh, healthy, and at their best throughout the year. If he plays his cards right, Cashman has handed the manager a nearly unparalleled collection of weapons to deploy in an effort to end 2019 the way Yankees fans expect: with World Series title number 28.